When you think of famous folk from Manchester, your first thought may be David Morrissey, the Smiths frontman who was responsible for the band’s poetic (and often melancholic) lyrics. But not all Mancunian poetry has been set to music, and the city and its surrounding areas in fact boast a plethora of connections with numerous renowned poets, from old favourites such as Lord Byron, to contemporary punk poets such as John Cooper Clarke. We’ve rounded up some of the most famous wordsmiths from this northern metropolis, and some of the places you can visit to follow in their footsteps. Contrary to common belief, poetry’s not always about dusty old books and antiquated verses about daffodils and awe-inspiring landscapes. At least that’s what the work of John Cooper Clarke shows us! 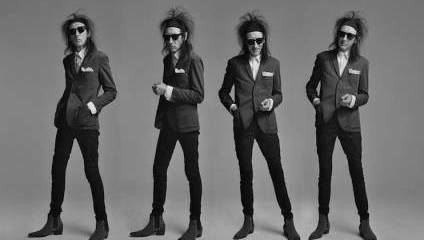 A performance artist who rose to fame during the 70s and became known as the 'punk poet', John Cooper Clarke recently returned to the pop-culture spotlight when fellow Northerners the Arctic Monkeys used one of his poems as the lyrics for their song I Wanna Be Yours on their hit album AM. So, if you’re a fan of Alex Turner and his bandmates, why not learn more about the poet that inspired them by heading to Cooper Clarke’s birthplace, Salford in Greater Manchester. Meander around the streets whilst you read one of Cooper Clarke’s most famous poems Beasley Street, which explores the serious issues of inner-city life including poverty, class and politics. No doubt you’ll be able to see changes and evidence of gentrification that has occurred since the punk poet wrote his seminal work, so if you need a reminder of how things used to be, why not head to the Working Class Movement Library, which records over 200 years of organising and campaigning by working men and women for social and political progress. Or, if you want to continue along the theme of poetry set to song, why not visit the exterior of Salford Lad’s Club, a recreational facility where The Smiths posed for a photograph which was used inside the sleeve of their 1986 album The Queen is Dead. Whilst born in Scotland and educated at the University of Liverpool, Carol Ann Duffy has now set up camp in Manchester, and lectures in poetry at Manchester Metropolitan University. And who better to teach the next generation of rhymesters than the UK’s current poet laureate? You may not be able to sneak into one of her lectures upon a visit to Manchester, but if you’re dying to catch a glimpse of the Duff, why not plan your trip around one of her frequent events run by Manchester Writing School, where she is Creative Director? Or, if you fancy following in the poet laureate’s footsteps, you could always sign up for a writing course yourself! Lord Byron may be famed for his poetry marvelling at the magnificence of Greece and Italy (and for sleeping his way across the continent), but did you know he actually has a close connection with Rochdale in Greater Manchester? Even though he was born in the English capital, the renowned Romantic was closely tied to Rochdale, by name if nothing else, as the 19th Century bad boy’s full title was Baron Byron of Rochdale. The ancestral home tied to this title was located in Nottinghamshire (who ever said the English aristocracy made sense? ), but Byron did in fact spend some time in the small northern town. Hopwood Hall, the house in which the poet he once stayed (and where he put the finishing touches to his narrative poem Childe Harold’s Pilgrimage) is currently being renovatedby Californian Hopwood Dupree, who plans to live in the house, but also keep some of it open to the public. Here’s hoping we will soon be able to see where the “mad, bad and dangerous” poet once laid his head. Last but not least, no poetry tour to a city would be complete without a visit to where all good poetry is kept- a library. Named after entrepreneur- and Manchester’s very first millionaire– John Rylands, the John Rylands Library is renowned for its dramatic interior, and has been acclaimed as one of the finest examples of neo-Gothic architecture in the Europe! Take a tour around the antiquated halls and secret staircases to get a look behind the scenes of this literature powerhouse (which is home to one of the finest collections of rare books, manuscripts and archives in the world), or simply set up camp with a stack of poetry books in their historic reading rooms, where anyone is allowed to study. Better not start orating your favourite verses though, as we all remember being told at school silence in the library!